Combined archaeological and ecological investigations in a large ancient oak forest in Central France have revealed a dense network of ancient human settlements dating from the Roman period. We demonstrate a strong correlation between present-day forest plant diversity patterns and the location of Roman farm buildings. Plant species richness strongly increases toward the center of the settlements, and the frequency of neutrophilous and nitrogen-demanding species is higher. This pattern is paralleled by an increase in soil pH, available P, and 15N, indicating the long-term impact of former agricultural practices on forest biogeochemical cycles. 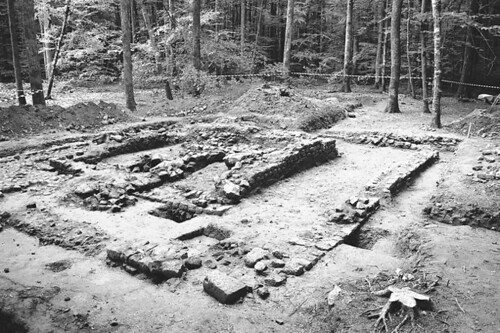 These extensive observations in a forested region on acid soils complement and confirm previous results from a single Roman settlement on limestone. Ancient Roman agricultural systems are increasingly being identified in contemporary French forests; the broad extent and long-lasting effects of previous cultivation shown in this study require that land-use history be considered as a primary control over biodiversity variations in many forest landscapes, even after millennia of abandonment. One interesting thing is that calcium carbonate leaching from the building's mortar alters the soil pH, and consequently affects nutrient availability. This increases the number of species found close to these settlements. That's right: mortar that is at least 1700 years old is still determining plant community composition. The J Train here. Lindsay asked me to stop by and do some guest posting while she's away, and while I hate to have to do it under these circumstances, it's always an honor. There are problems with the list, though. First of all, Celine Dion's "You Shook Me All Night Long" is #15. Friends, if I truly thought there were fourteen musical performances worse than this one in the universe, I'd jab a kebab skewer into each ear. There are plenty of deserving stinkers in the top 15 (Faith Hill's "Piece of My Heart", Madonna's "American Pie", Counting Crows' "Big Yellow Taxi"), but none that come close to Celine's crime against humanity. Also, I'd argue that the #1 worst cover--Eric Clapton's unplugged "Layla"--is not a cover at all, because by definition you can't cover yourself. (I also have a soft spot for Unplugged, since it came out while I was in a huge high school Clapton phase, and I doubt there's an album I've spent more time listening to in my lifetime except maybe TMBG's Flood.) Same goes for Elton John's unfortunate "Candle in the Wind" rewrite. #2, Puff Daddy's "Every Breath You Take" (sic), is also not a cover, because it isn't an attempt to do the same song; it's a distinct song called "I'll Be Missing You" based on the Police track. It's a crime against decency for its own reasons--it's the laziest example of sampling ever, and yet it's the one song that always comes up when you're trying to defend sampling as a legitimate artistic practice against people who have never heard of DJ Shadow or Paul's Boutique. But I wouldn't call it a cover. Those criticisms aside, it's a fun piece of musical recreational outrage. Are there any deserving covers they've missed? Dad with Book, originally uploaded by Lindsay Beyerstein. This is the last picture I took of my father, who died on June 25th. 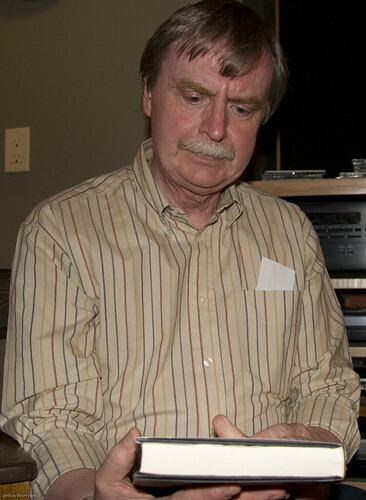 The picture shows him unwrapping a 60th birthday present. It was taken less than a month before. Quite simply, I adored my father. He was among the most ethical people I have ever known. I don't think it's an accident that he was also one of the most fulfilled people I've had occasion to meet. Dad was a scholar, an activist, and a devoted family man. Dad loved all knowledge, no matter how arcane or obscure. He believed in the power of reason, compassion, and humility. He lived a life of service. I loved and respected him so much. It's a rare person who could leave so little unsaid or unfinished, despite having his life cut short so suddenly. Just killing time at the airport. According to the "Family Jewels" documents released today, the CIA spied on Britt Hume. This was back in the seventies when Hume was a reporter working as a "leg man" for columnist Jack Anderson. The operation was code named CELOTEX II. 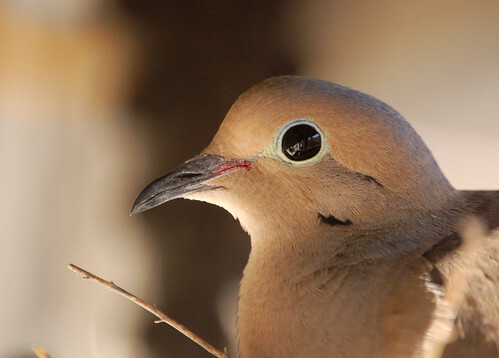 Mourning Dove, originally uploaded by . : sandman. I lost someone very close to me yesterday. I can't talk about it yet because not everyone has been notified. If any of you former Majikthise guest bloggers feel like contributing some posts over the next couple days, I'd really appreciate it. Your logins should still work. The War on (some people's) Drugs trumps the First Amendment. I like Chris Weigant's suggested alternative phrasing: "Legalize bong hits 4 Jesus." Part of me takes comfort in the fact that the percentage of Americans who believe in the Saddam-9/11 conspiracy theory dwarfs the percentage who approve of George W. Bush. Yet, part of me recoils at the irrationality this discrepancy implies. I'll just hope that most of the S-9/11 believers are also mortally outraged about the response to Katrina. Houston City Council voted to cut the funding for the only city-run facility for day laborers. 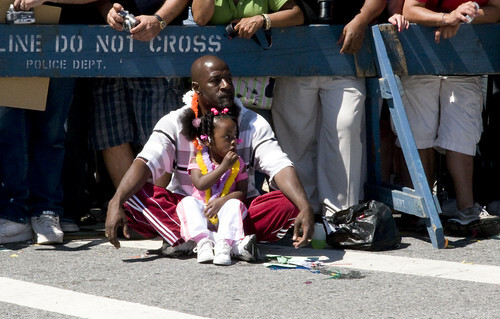 Daddy and Daughter, originally uploaded by Lindsay Beyerstein. Watching the Mermaid Parade on Surf Avenue.